A beautiful interactive infographic by Gregor Aisch visualizing the donations to political parties in Germany can be found on the blog vis4.net. This is especially interesting since the influence of lobbyism on German politics has become more and more clear recently. More transparency in this issue is crucial. Germany is one of the few countries in the world that has not ratified the United Nations Convention on Corruption (UNCAC) which is mainly because of a lack of law enforcement in the field of bribery of members of parliament. Referendum about school reform – class struggle in Hamburg? 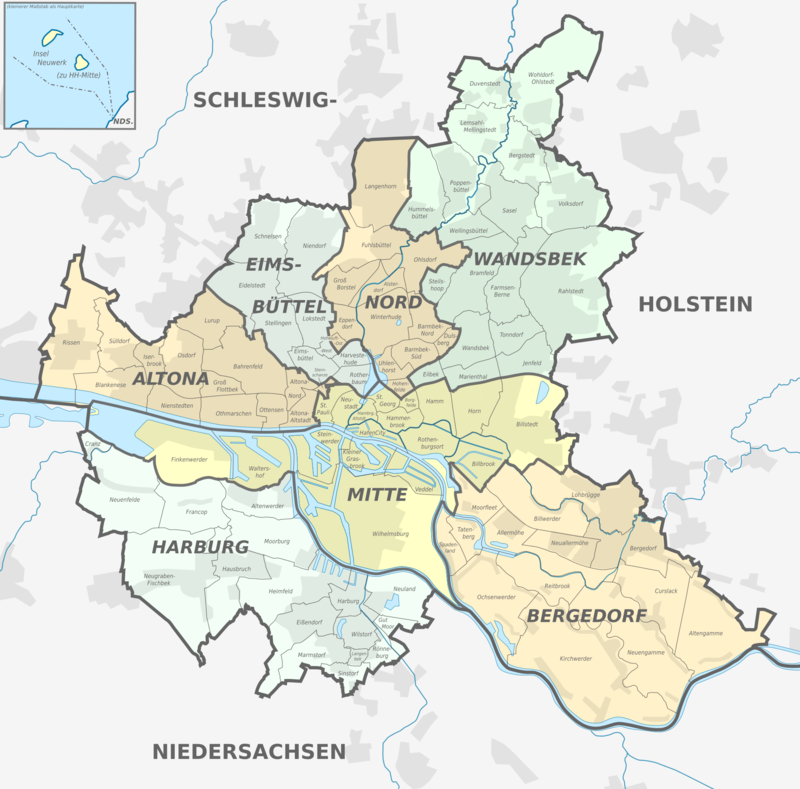 The recent referendum in Hamburg reveals some interesting coherences. Subject was a school reform that aimed at a letting students learn together at the same school till 6th grade. And then split up into two different kinds of secondary schools (Gymnasium and Stadtteilschule). Till now it is common in Germany to seperate the kids after 4th grade. They then go to either Gymnasium (aiming at a higher education entrance qualification) or lower level schools like Realschule or Hauptschule. It is often critized that to some extend a social segregation goes in hand with this educational system. Indeed children from the upper class tend to achieve a university entrance qualification significantly more often than children from the working class. The reform aimed at attenuating this effect. However in Hamburg an obscure parents initiative has formed with the goal to prevent the reform. They don’t lay open who supports them with money of which they have enough to run an effective PR campaign that brought a successful result at the end since the reform was rejected by the voters at the end. This leads to questioning the sense of such a basic democratic referendum when there are opinions and interests that are powerful enough to run a campaing while others are not. The referendum was meant for the benefit of the lower class whose children might profit from a longer learning together at elementary school. But surprisingly the lower class did not participate much in the referendum. Looking at the maps of the voter turnout and comparing them to a map that reflects the social situation in Hamburg it is striking that the districts with the highest voter turnout are congruent with those with the highest average income. 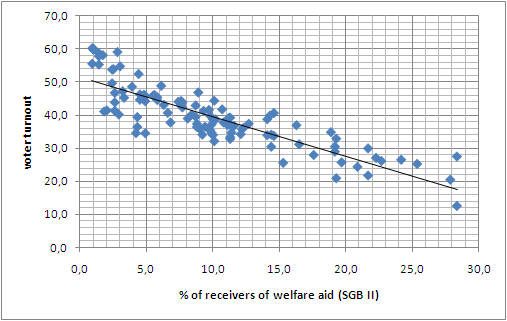 Or, the districts with the lowest voter turnout are the ones with the highest share of inhabitants receiving welfare aid. The amount of schoolchilds living in a district, although they were the main subject of the referendum, did not correlate with the voter turnout. Some people are talking about a class struggle. One might get to this conclusion considering the circumstances. But one should also not forget that this referendum reveals the absurdity of the German educational system where every federal state can make its own laws. And some federal states are very small (Hamburg for instance is just the city itsself – a city state so to say). Some middle class families might have voted against the reform simply because they would not like to be confronted with a different school system should they move to the suburbs one day. Election results have recently been a hot topic in Germany with the past elections in the federal state of Northrhine-Westphalia. 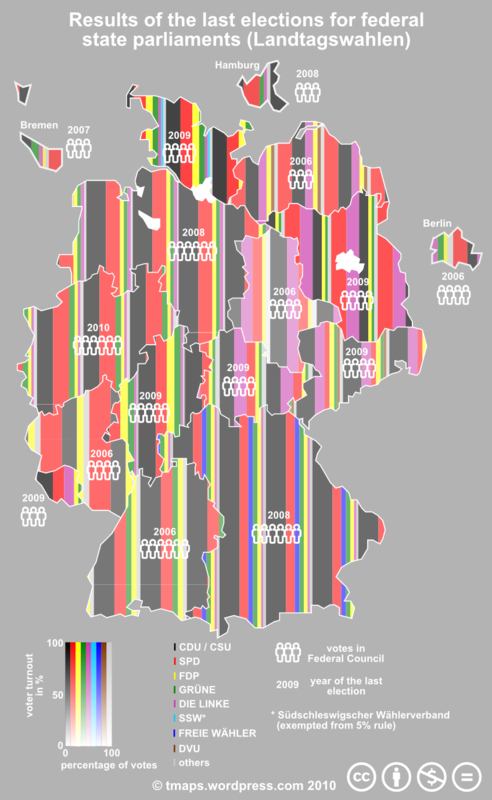 I used this occasion to finish an idea I had in mind for a while: Visualise the last election results as a bivariate stripe pattern. The method as such is not new however taking the voters turnout as second variable adds some spice to it. Looks a bit like a 70’s wallpaper, doesn’t it? The term “others” refers to the accumulated share of all votes for parties that did not reach 5% of the votes (threshold to gain a parliament seat). There seems to be a lot in disorder these days in Europe. Greece on the edge of bankruptcy and the Euro under pressure like never before. However the skeletons that come out of their closets now have been knocking for a while. The situation after all is not amusing and would diserve a proper map visualising data that shows what is really going on. The data is available but if the day just had more than 24 hours… The map will come sooner or later I promise. It is probably going to be an angry map since that issue and how our politicians deal with it is upsetting me regularly. So for now a more amusing map (I hope the authors meant it that way) found on the Economist online yesterday. For those who want to get to know more about the current mess in Europe and what should be done, I recommend reading this open letter from the German blog nachdenkseiten.de. Make sure to read the article to understand what is behind that new order. The newspaper Le Figaro shows an interactive map of the results of the regional elections in France. Looks pretty much like a kick in the a** for Sarkozy’s party.